Manchester United to step up interest in Serbian midfielder? 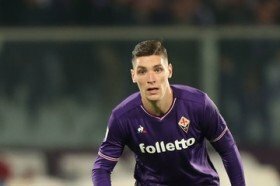 Manchester United are reportedly weighing up a winter move to sign Fiorentina's Nikola Milenkovic despite the defender being a target for former boss Jose Mourinho. Mourinho had watched the player up close during an international friendly involving Serbia earlier in the season and the Portuguese had thereafter instructed the club's scouts to provide an update on the player's progress. Since then, United have taken the decision to axe Mourinho from the head coach role but this may not supposedly end their interest in signing Milenkovic, La Repubblica claims. It is added that the club could make an approach for the Serbian when the transfer window reopens with caretaker boss Ole Gunnar Solskjaer unlikely to have a major say on player arrivals next month. Despite this, United are unlikely to go on an extended spending spree during the upcoming transfer window with the club prepared to wait until next summer where they are expected to recruit a permanent head coach.